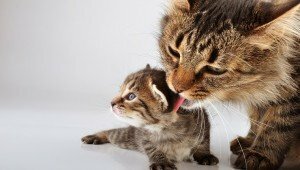 Raising a tame cat who's social and outgoing requires a combination of a good upbringing, even from the time the kitten is in the womb, early handling, and a mom cat with a good temperament. Here are some tips to help your kitten grow into a social adult cat. If you want a cat who's confident and sociable, expose your kitten to lots of people, sights, sounds, and experiences. Learn the dos and don'ts of kitten socialization.